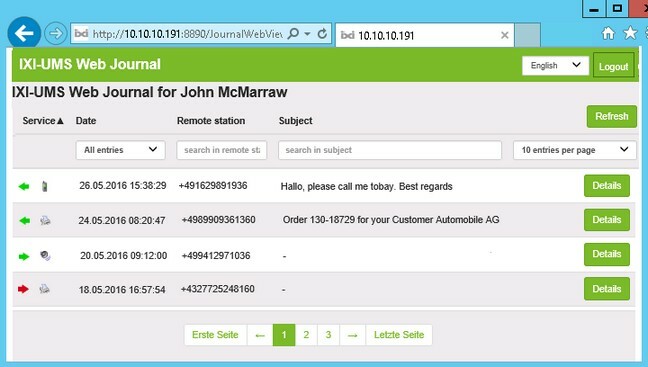 With the “ixi-UMS Web Journal“, ixi-UMS Business offers every user a browser-based view of his ownsent and received ixi-UMS messages. Requirement: The necessary user information must be available in the LDAP-user database. The user logs in at the “ixi-UMS Web Journal“ with his e-Mail-Adresse an the LDAP password. By means of the deposited sender e-mail address and the UMS-recipient number, the data are detected and the respective entries are displayed. 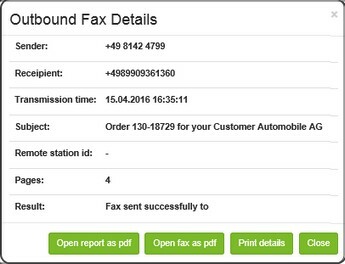 The User can displayed all relevant data for send an receipt UMS message in detail. If the option Archive associated files activated in ixi-UMS Business Server, the user can open, print and save all SMS and fax messages include reports. Also he can save and listen voice messages. All incomming messages are transmitted in the bound Mail system.